UPDATE: Jack Campbell has been assigned to the ECHL. For the first time in a long time, Texas is on the outside looking in as far as the playoffs are concerned. Last night's regulation loss dipped Texas to a .516 points percentage and moved them into fifth and place. A win by Bakersfield late on the West Coast slipped them to sixth and out of a playoff spot for the first time this season. The cavalry is on its way, perhaps. After another night of subpar goaltending, Texas will put Maxime Lagace in net for this afternoon's game. 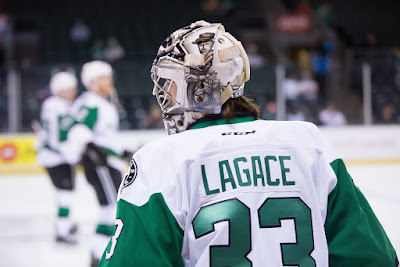 Lagace was a quiet callup yesterday afternoon. He hasn't played for Idaho since December 16th, a game where he was pulled after allowing three goals on four shots. The Steelheads came back to win that game 8-5. Lagace is not a cure-all for the Stars' goalie woes. He's not been spectacular in Idaho (3-5-2, 3.09 GAA, 0.886 SV%). Perhaps it is a kick in the pants that Texas needs. The Stars cannot put all the blame for their losses on the goaltending. However, if you look at last night's game, in which they outshot San Antonio 48-26, that's a winnable game for with just average goaltending. Texas now hopes Lagace can at least provide that for today's game. We need to bring him back!! !